General Officer Commanding (GoC) 16 Crops, Lt Gen Saranjeet Singh said, "The Army was alert and would not allow any attempt (of infiltrating militants) to succeed." 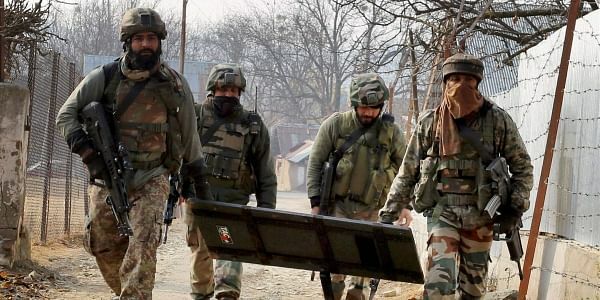 JAMMU: A top Army official today said that a large number of militants were trying to infiltrate along the Line of Control (LoC) but the security forces were "alert" to foil the designs. "There are a large number of people (militants) staged at the launching pads to come to this side (along the LoC)," said Lt Gen Singh, who commemorated the day by wreath-laying ceremony at the Naman Sthal, the War Memorial at Poonch. "As you know our neighbouring country (Pakistan) is aiding terrorism by providing them arms support. They are using them against us," he said in response to a question about the support of Pakistan to terrorists. The Army commander said that they were giving a befitting reply to the Pakistani Army in response to their increased ceasefire violations along the LoC. "We have given a befitting reply. There will be no leniency," he added. "They are engaged in ceasefire violations. This year, they have violated (ceasefire) in large numbers without any reason," Lt Gen Singh said. The Army chief said, "They have fired from their civilian areas and targeted our civilian population." White Knight Corps joined the people of Poonch to celebrate the historic 'Poonch Link-Up Day' with gaiety and fervour here. The day marks the link-up carried out by Brig Pritam Singh's forces with Brig Yadunath's forces from Rajouri at the Danna Ka Pir on November 21, 1948. Lt Gen Singh was joined by veterans, senior Army officials, civil administrators, local politicians and the people of Poonch along with school children in the wreath-laying ceremony at the war memorial.